The Credit Pros has provided their A+ BBB accredited credit repair services since 2008. They offer a wide range of removable items, extra value added services like cease and desist letters to collection agencies, and a 90-day 100% money back guarantee. Founded in 2008, The Credit Pros has already achieved high credentials: they are a registered member of ethics.net and have been named one of America's fastest-growing private companies by the Inc. 5000 for 5 years in a row. Many of their staff, including the president of The Credit Pros, are certified FICO® professionals and in-house licensed attorneys. 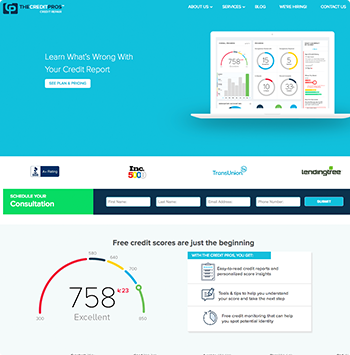 You can contact The Credit Pros for a 100% free initial consultation and if you choose to sign up, they pull your credit reports from the three major credit bureaus (Experian, TransUnion, and Equifax) to look for and dispute unverifiable items. You will be given 24/7 access to a case manager and an online client portal to check the status of your credit report. 3 to 5 business days after you sign up, credit repair specialists work with the bureaus to delete erroneous items from your credit reports. 45 to 60 days after signing up, you receive an updated copy of their credit report (if you have a credit monitoring service). You must also mail or fax updated credit reports so The Credit Pros can continue looking for erroneous items. Although each individual case is unique, you should expect to see results in the first 90 days. Industry accreditations: The Credit Pros is accredited by the Better Business Bureau with an A+ (highest rating possible). 90-day 100% money back guarantee: In case you are not satisfied with their services, The Credit Pros offers a 90-day money back guarantee. Unlimited credit disputes each month: The Credit Pros is able to dispute an unlimited number of inaccurate, obsolete, and unverifiable items from your credit report every month (unlike some competitors which limit the number of items they challenge on a monthly basis). This ultimately means they can produce faster results. Free credit monitoring and identity theft protection: The Credit Pros offers complimentary credit monitoring services to help you spot any potential identity theft. Identity theft restoration and insurance are also included in your service. Reduce collection calls: The Credit Pros can send cease and desist letters on your behalf to help with reducing future unwanted contact from collection agencies. Extra educational services: In addition to credit repair services, The Credit Pros offers educational tools for you to make good credit choices in the future. Wide range of removable items: Late payments, tax liens, closed accounts, charge-offs, student loans, foreclosures, collections, negative settlements, and judgments can be removed from your credit reports. Fast, legal, and affordable results: You may see initial results within the 90 days, but since each case varies, The Credit Pros reports that it takes around 6 to 12 months to see full results. The initial set-up costs and the monthly fee ($119) of The Credit Pros are on the higher side. However, The Credit Pros also offers unlimited disputes, which means that the average customer may see faster results and thus spend less time enrolled in the program. The Credit Pros does not currently offer services in 4 states (Maine, Minnesota, Oregon, and Kansas). In 2012, the attorney general found The Credit Pros guilty of unlicensed credit repair activities in Idaho and the company had to pay $1,000 in restitution fees. The Credit Pros is one of the few companies that reviewed that offers a 90-day 100% money-back guarantee. They are also one of the few credit repair companies that offer both pay-per-deletion and monthly plans. Additionally, The Credit Pros offer extra educational services and complimentary credit monitoring and identity theft services. Individual Monthly Enrollment: This plan is $119 for enrollment and $119/month. Couple Monthly Enrollment: This plan is $279 for enrollment and $159/month. Pay For Results Plan: This plan is $379/individual and $579/couple for the first payment, $100 for each confirmed deletion per bureau, and $150 for public records. If you are not satisfied with the service for any reason, you have the ability to cancel anytime without any added fees and receive a 100% money back guarantee. How does The Credit Pros compare to its competitors? The Credit Pros has many industry accolades: they are a registered member of ethics.net and hold an A+ accreditation with the BBB. Additionally, The Credit Pros has in-house licensed attorneys that are certified FICO professionals, a 90-day money back guarantee, and they offer both a pay-per-deletion and monthly program. Is this credit repair service legal? The Credit Repair Organizations Act (CROA) sets tough laws to ensure company compliance and protect consumer rights. For example, the CROA states that no credit repair organization can bill a customer until services are performed. However, many companies charge a "first work fee" in order to acquire credit reports. A for-profit company must also accurately inform you of what they can and cannot do in addition to providing a written contract and allowing the contract to be canceled within three business days of signing. If you ask, a legitimate company will inform you that you have the right to fix your own credit. Companies that guarantee to erase bad credit or raise your credit score by a high amount very quickly is a red flag. Because The Credit Pros follows all of these guidelines, they are a trusted credit repair service. Is this a guaranteed fix for my credit score? Because of the guidelines laid out by the CROA, no credit repair company can guarantee the removal of bad credit.